From the Series: Who Wrote That? J.K. Rowling is one of the most popular authors of the late 20th and early 21st centuries. Her books about Harry Potter’s adventures are widely read by adults and children alike and have been translated into more than 64 languages. With the recent completion of the seven-book series, Rowling’s popularity is at an all-time high. But Rowling didn’t start out famous. As a single mother, she struggled for many years before her books were published. 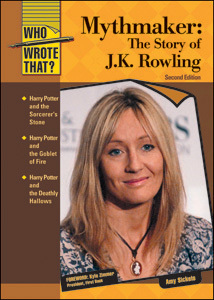 Mythmaker: The Story of J.K. Rowling, Second Edition has been fully updated to tell her inspiring life story. This biography has not been authorized by J.K. Rowling. Full-color photographs. Chronology. Bibliography. Further reading. Box features. Web sites. Index. Amy Sickels lives in New York City. She received her M.F.A. from Pennsylvania State University and has published stories and essays in literary journals such as The Greensboro Review and The Madison Review.